At Barco’s Painting of Colorado, we strive to provide our clients with exceptional work at every step of the way. But what makes us different than the other options out there? There are a number of things, and as a matter of fact, that’s the topic of today’s post! We strive to be more than just painters, and our goal is to make our community a better place. One of the ways we do this is by offering incredible work at a fair price. And so, without further ado, let’s take a look at what makes Barco’s Painting of Colorado the go-to painting company in Castle Rock and the surrounding areas. Getting the color of your home is important, but it can be tricky to get things just right. The good news is that at Barco’s we happily offer a free in-home color consultation with full interior repaints! Barco’s is a Top Rated Local® painting company, and whether you search for reviews on Google, Yelp, or Facebook, you’ll see that we do right by our customers. Go ahead and search for us and see for yourself! We believe that good companies shouldn’t have anything to hide, and in this day and age, reading reviews is as easy as doing a quick search. We’re also a Broncos Business Pick. What that means is that we’ve agreed to maintain a high level of quality and service, and that we’re willing to go above and beyond for our clients. Click here to learn more about what it means to be a Broncos Business Pick and what the process entails. 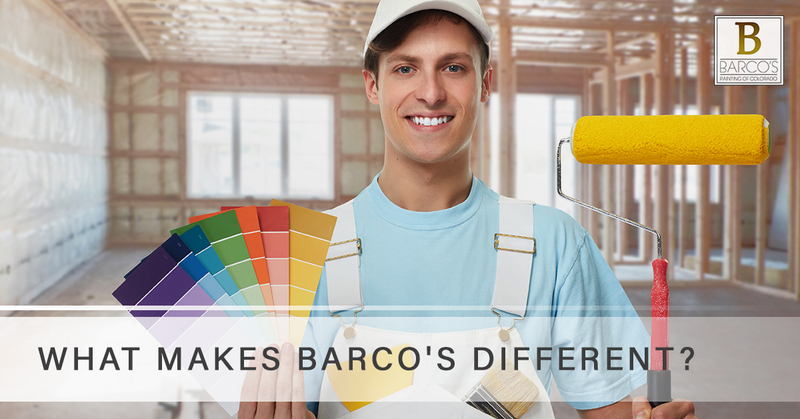 Barco’s is currently offering up to $300 off of your next project, so if you’re in the market for a whole home repaint on the inside or outside of your home, now is the time to save big! This offer won’t last long, so reach out to us today to get the process started. At Barco’s, we handle interior and exterior painting jobs, but we’re also happy to tackle wallpaper removal, cabinet painting and refinishing, high-end detail work, pressure washing, wood staining, and much more. In other words, we can do it all! Whether it’s refinishing a deck, partnering with a local company, or doing work for a homeowner’s association, turn to us to make sure the job gets done right. Learn more about all of our services here. At the end of the day, our mission is to provide people with incredible work done at a fair price. No matter the job you have for us, count on us to do it the right way. We pride ourselves on making sure the work we do will hold up wonderfully for years to come, and we use only the highest quality products to do it. In short, we want the end result to amaze you, not only because it looks amazing, but because the price was fair. Are you looking for a painting company in Castle Rock, Parker, Highlands Ranch, Lone Tree, or Littleton? If so, Barco’s Painting Colorado is up to the task! Whether it’s interior painting, exterior painting, or doing work on decks or fences, we can help. Whether the goal is to transform the interior space of your home so you feel more comfortable and cozy or the outside of your house is in need of a new coat of paint, put your trust in Barco’s to get the job done well. Contact us today to get the process started.